About 200 years ago, some English guy was sailing around the seas of the southern hemisphere and accidently stumbled upon a land that was full of desert, flies, a blazing sun, some of the strangest and most deadly animals you could ever find, and most importantly GOLD. Listen to the Australian Slang Podcast! So, as time went on, these criminals started to be released, and lived amongst society as normal people again. In all of this time, the way these semi-educated, ex-convicts spoke started to change. Their accent was a mixture of many different types of English from all around the U.K., which has evolved into what we call today… AUSTRALIAN ENGLISH!! Firstly, let me say that Australians don’t speak British English. 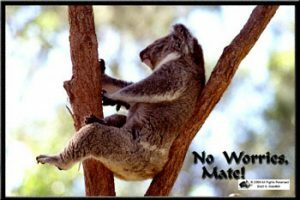 In Aussie English (Aussie- Australian), there are hundreds of slang expressions and different sayings that it would be impossible to explain them all in this post. Since living away from Australia, I have noticed many other foreigners, especially Americans, find some of the common words I use different, and in some cases funny. 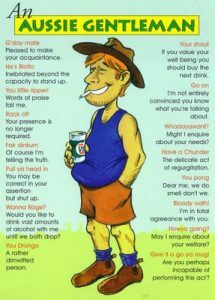 Here are some of the common everyday Australian words and sayings. In Australia everyone is your mate. “Mate” is a way to say friend or colleague in Australian English. 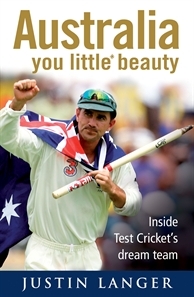 It has become a iconic expression for Australia and is used with people you don’t even know. “G’day mate!” = “Good day mate” *can be used to greet someone at any time of the day. What do you reckon? / Whaddaya rekon? Although this phrase is used in other types of English, Australians tend to use this term on a frequent basis. Youse is one of the biggest grammar mistakes made by Australians on a daily basis. This word is used so commonly that most people don’t even know that it’s incorrect. In Australian English “youse” is used as the plural form of “you.” The correct plural of you is you. In other places people have a tendency to say you guys or you all/ya’ll. This one is also big in British English, but I believe the Australians definitely use is more often. No worries is a way to say you’re welcome or no problem. I know you’re probably thinking that people say cheers all over the world as a way of celebrating before you drink a beer, but in Australian English it is used to say thank you. It’s also used when you say goodbye to someone in an informal way. The word keen means to be eager, excited or interested in something. In Australia we use this to ask friends to join us in doing something or to get people excited about something. In Australian informal English, we use the expression “heaps good” to say that something is or was really good. Both of these terms are used in the same way to celebrate or to show excitement about something. Even though we use the word beauty, these expressions are never used to express beauty. -“The Wallabies just beat the All blacks!” “You little ripperrrrrr!!! *The Wallabies are the Australian Rugby team, the Allblacks are from New Zealand (Australia’s rival). Unfortunately, these people don’t realize that the way these awesome guys speak is old fashioned and only common with people from farms and country cities. Some of these older expressions are still used by some people but generally for humorous purposes. Like most other styles of English, whether it be American or British, to perfect the language you need to have a lot of contact with that accent and be exposed to that culture. If you would like to work on your Australian accent and pick up some common Australian terms, I suggest you look for Australian media online and spend a couple of months watching Australian movies, T.V. series, listen to Australian music. Hey Chad, great article man. I always appreciate this kind of topic. Anyway, can I use mate for girls as well? Hey Chad I’m here again! As I told you in another shout out, I’m moving to Sydney next year. I want to be comprehensible to Australians when I arrive there. So far, I haven’t found a Australian pronunciation dictionary, however I’ve got the Oxford dictionary for British pronunciation and I realized that Australian English is very close to British English. Do you think I should get rid of my American accent and trying to sound like British? Hey Rubin, Great to have you back! Bookmark us or sign up for our mailing list here https://reallifeenglish.leadpages.net/101-words-you-never-learn-school/ so we can send you weekly updates and keep you connected! Thanks for saying hi. 'Youse' is NOT commonly used any more. Much more rife is …'anythink' & 'nothink' in place of 'anything' & 'nothing.' Also 'arksed' instead of 'asked'. "Cobber' – a male 'friend/mate,' is still used in rural areas of Tasmania. Chad, thanks for the info. My first novel (published December 2013) has an Australisn character my readers fell in love with. I'm currently working on book two of the three-part series. My Aussie character has a bigger role in book three. 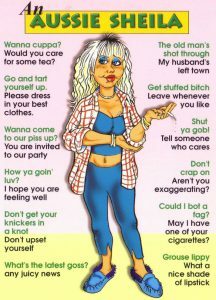 Although this character is based on my dear friend from Brisbane, I haven't seen her in a while and need to refresh myself on the common vernacular. Thanks so much! (Blackwater Creek, by Donna R Brown, available on Amazon, also for Kindle, Nook, available for order at your favorite bookseller.) I wouldn't mind some fair criticism. Thanks again! 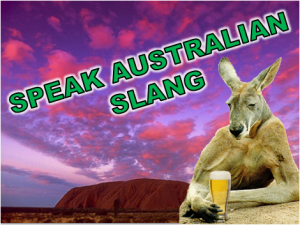 If you plan to go to Australia, learning the slang is essential if you want to socialise. At some stage, you’ll be invited to the “local” (pub) and you need to know what to do when it’s your “shout” (turn to buy the beers).